'He was still bleeding. I yelled, "Someone's killed Father." I breathed in kerosene air, licked the thickness from my teeth. The clock on the mantel ticked ticked. I looked at Father, the way hands clutched to thighs, the way the little gold ring on his pinky finger sat like a sun. I gave him that ring for his birthday when I no longer wanted it. "Daddy," I had said. "I'm giving this to you because I love you." He had smiled and kissed my forehead. On 4 August 1892 Andrew and Abby Borden were murdered in their home in Fall River, Massachusetts. During the inquest into the deaths, Lizzie Borden was arrested and charged with the murder of her father and her stepmother. Through the eyes of Lizzie's sister Emma, the housemaid Bridget, the enigmatic stranger Benjamin and the beguiling Lizzie herself, we return to what happened that day in Fall River. 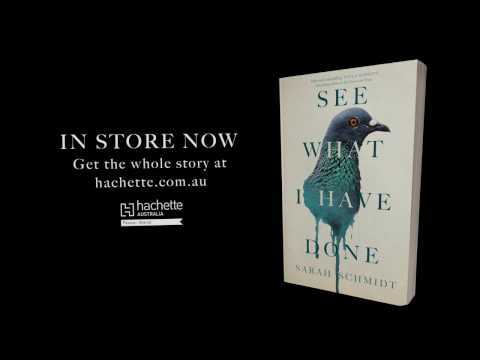 See What I Have Done by debut author Sarah Schmidt is a lyrical and richly imagined novel about the infamous (alleged) axe murderer Lizzie Borden. For anyone unfamiliar with the case, in 1892 Lizzie Borden was tried and later acquitted of the double homicide of her father and stepmother, who were found brutally hacked to death in their home in Fall River, Massachusetts. Though the jury found Lizzie innocent of the crimes, she was widely believed guilty and the murders remain unsolved to this day. The case was so notorious that it inspired a macabre nursery rhyme... Lizzie Borden took an axe / And gave her mother forty whacks / When she saw what she had done / She gave her father forty-one. See What I Have Done is both utterly absorbing and incredibly unsettling - not to mention super-duper creepy! There is a suffocating, almost claustrophobic atmosphere in the way Schmidt writes about the Borden household. This is a horrific tale about a highly dysfunctional family in which close familial bonds have become warped and strangling. The descriptions of sounds and smells are so evocative that the Borden house is truly brought to life. The story is largely centred around the day before, and the day of the murders - told through alternating perspectives. We have Lizzie's fractured and unreliable narration, as well as the perspective of her devoted older sister Emma, the beleaguered maid Bridget, and the hired brute, Benjamin. Reading this book is like entering a wild, feverish nightmare. In fact, it made such a deep impression on me that as soon as I finished it I was compelled to hit Google with a vengeance, determined to find out everything I could about Lizzie Borden. See What I Have Done is incredibly enthralling, overwhelmingly intense and eerie as hell. Readers beware, this book will haunt you! Watch the movie 'Lizze Took An Axe' rather than read this book. It just messed with the known facts of the case. It could confuse people. It is fiction, but tends to read like it is not. Just about everybody knows about Lizzie Borden and "the axe". While it was an horrendous event that happened well over one hundred years ago it still resonates today and I have always found it fascinating. Did she do it ? There were, to all intents and purposes, just two women in the house that day that could have carried out the murders but, and it is a big but, there were others with motives at the ready. This book created a lot of senses for me, chief of which was the way the author was able to extend beyond the pages the awful feeling of claustrophobia, the oppressive heat at the time and the stench of the mutton broth, left standing to be ptomained and reheated and served day after day. I actually felt very queasy as I read. Lizzie's father had the means to make life easier for them all but he chose not to; the epitome of a tight-fisted, selfish man. This book is a great read in that it is novelised but includes all the facts of the case and makes the various characters come alive and speak from the pages. That there is an undercurrent of incestuousness throughout the book only serves to highlight the terrible atmosphere in which the people lived and the possessiveness that took hold in an iron grip. My own view is that Lizzie did commit the murders, the event that took place in the barn a good enough reason, in her mind, to retaliate in that most awful of ways. I am waiting for the next book by this author. The multiple narratives and perspectives of the characters were interesting to follow. Some characters were much more endearing than others so it was nice to see the world through the differing lenses. I feel the writer was more focused on writing in an unusual way rather than just giving us a well rounded informative story about these intriguing murders. It unfortunately left me with more unanswered questions than what I started with. I then went and researched the history to find out a more complete picture of this mystery.